You know the type. Always quick to blame you for your moral complacency. Always righteously indignant at your moral failings. Always keen to highlight their virtue and your vice. I am talking about moralists, of course. The self-appointed guardians of moral order. The people who pour scorn on the rest of us. If you are anything like me, you won’t like moralists. You will find them intrusive, overbearing and annoying. You’ll tend to ignore them or ridicule them. Maybe not to their faces. Maybe you will wait until they are out of earshot. But once they are you’ll whisper to your friends “Who does she think she is?” “She should mind her own business!”. I know this attitude intimately. Sometimes I feel like I spend my whole life surrounded by moralists. It is a professional hazard — university departments are full of them. But why do I dislike them so much? Why do I find them so off-putting? Philosophers have tried to answer these questions, and it turns out that many of them share my discomfort. They dress it up in the form of reasoned criticism. They argue that moralists degrade and undermine the system of morality: that they foster a climate of moral intolerance and help to kick-start a moral arms race. I find these arguments reassuring. They convince me that I am right to be morally sceptical and reticent. But this also makes me suspicious. When I probe the depths of my disdain for moralists I worry that its true origin lies in the fact that I think moralists are often in the right — that oftentimes their moral critique is on point. I want to explain why I think this in what follows. 1. 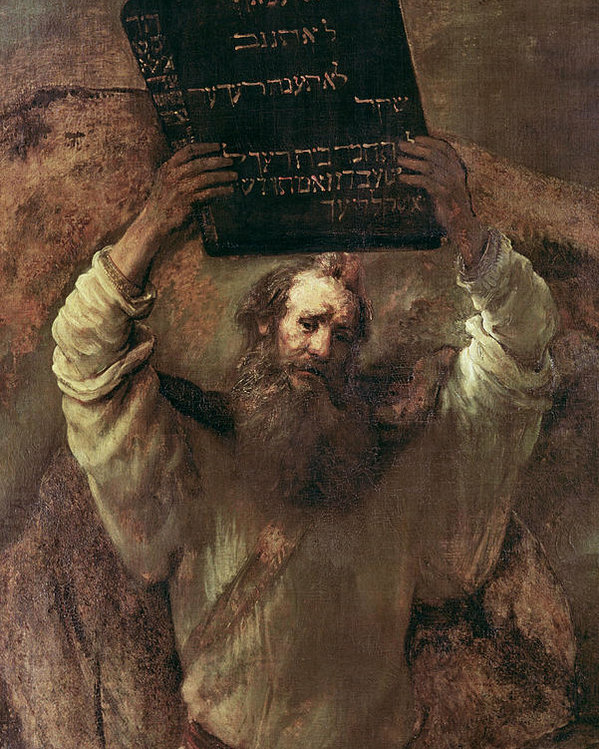 What is moralism? What is a moralist? Let’s start by clarifying what a moralist actually is. Philosophers have a particular take on this. They don’t see moralists as people who are just uniquely sensitive to moral norms and who eagerly identify and police our moral failings. They also don’t see moralists as people who use regressive or incorrect moral beliefs to criticise others. Catholic priests might be very keen to police the boundaries of our private sexual lives, but the problem with their doing so is not that they are moralists (though they may be that too). The problem is that they have the wrong moral beliefs and use those to criticise others (if you are a staunch traditional Catholic you won’t accept this — more on this problem later). Type 1: The moralist demands that others engage in supererogatory acts, not just obligatory acts. Obligatory acts are those that you are morally bound to do. It is perfectly appropriate for someone to demand that you do them. Supererogatory acts are above and beyond the call of moral duty. They are morally good (possibly very good) but they are not obligatory. The moralist tends to conflate the two and demand that we all go above and beyond the call of duty. An example might be the moralist demanding that you engage in some act of heroic self-sacrifice to save the lives of others. While most people would agree that heroic self sacrifice is morally commendable, few would argue that it is obligatory. 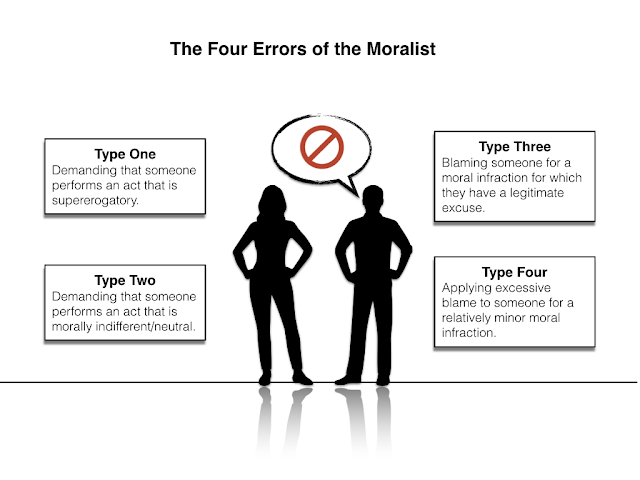 Type 2: The moralist demands that others engage in particular acts that are morally indifferent or neutral. In other words, the moralist tells us that we have to pick and choose between different acts that have no positive or negative moral value. An example might be the moralist claiming that you have a moral obligation to eat a particular flavour of ice-cream or see a particular film, when actually it doesn’t matter which flavour you eat or film you see. Type 3: The moralist blames others for engaging in immoral acts for which they have a legitimate moral excuse. An example might be a moralist blaming someone for breaking a promise to meet them at a particular location when the person had some serious illness that made it impossible for them to make it. Type 4: The moralist applies excessive blame to others for minor moral infractions. An example might be a moralist arguing that someone should be given a long jail sentence (or other severe punishment) for jay-walking, or that someone should be ostracised and ignored for being five minutes late to an appointment. Again, the interesting thing in each of these cases is not that the moralist gets morality completely wrong. They have, roughly, the correct conception of what is good and what is bad. The problem is that they overreact and over-demand. It should also be noted that this typology of moralism focuses on the negative, i.e. on moral criticism and moral demands. It is possible — and Archer acknowledges this — for a moralist to miscalibrated on the positive side too. So, for example, a moralist might be too quick to assign moral praise to an action. But even though this positive form of moralism is conceivable, it is the negative form that is probably more common and more irksome. We now need to figure out why this is the case. (1) Legitimate moral criticism is socially valuable. (2) Moralists tend to undermine the force and salience of legitimate moral crticism. (3) Therefore, moralists tend to undermine something that is socially valuable. Premise (1) should be common sense. Moral norms are important. If we all follow the moral code (and if that moral code is correct), society benefits. If some people (or some institutions etc) fail to do so, it is good if we can single them out and criticise them for their shortcomings. Legitimate moral criticism of this sort allows us to identify moral injustices and motivate moral reform. Many of the great social justice movements of the past (anti-slavery; civil rights reform; anti-colonialism; women’s rights etc.) have been premised on legitimate moral criticism. It is what gives them their energy and urgency. If people didn’t pay attention to legitimate moral criticism, or tended to ignore or overlook it, these movements would be deprived of a vital resource. The same is true on a much smaller scale. Moral criticism, when done right, has real bite: it can encourage someone to rethink what it is they are doing and change their conduct for the better. But if it loses this bite, this personal reform becomes more difficult (I won’t say ‘impossible’ because there are, presumably, other levers that could be pulled to change someone’s conduct for the better). Premise (2) is the core of the case against the moralist. The support for this is, in effect, a classic ‘boy who cries wolf’ argument. If moralists constantly overreact and over-demand, then they denude the force of legitimate moral criticism. If everything becomes morally obligatory, then you may as well say that nothing is morally obligatory; if minor infractions result in excessive blame, then it is quite likely that people will become desensitised to proportionate blame. The signal gets lost in the noise, and the people to whom the criticism is directed build up resentment and eventually start to ignore all forms of moral criticism. Ramping up [of moral criticism] contributes to group polarisation, where individuals come to hold more extreme views after deliberating with others, rather than moving toward a moderate consensus. The result of a moral arms race is that people will tend to adopt extreme and implausible views, and refuse to listen to the other side…Another consequence of grandstanding is that many people stop taking moral conversations seriously. They become cynical about the moral claims they hear in public discourse because they suspect that the speaker is simply trying to show that his heart is in the right place, rather than trying to help others figure out what we should do or believe. I suspect this is one reason why I often feel irked by moralists. I question their sincerity. I doubt whether they apply the same moral standards to their own behaviour and I suspect they are just engaging in a kind of virtue signalling (note: Tosi and Warmke also resist using this term in their article but I think it is apt). If premise (1) and (2) are persuasive, then the conclusion follows. Moralists are a problem because they undermine the value of legitimate moral criticism. Archer goes on, in his analysis, to argue that this criticism still applies if you think that morality is quite demanding (as some moral theorists do) because even if morality is demanding there will still be some distinction between superogatory acts and obligatory ones, some distinction between obligatory acts and morally neutral or indifferent acts, some legitimate excuses for moral failings and some sense of proportionality for moral blame. So, for him at least, moralists are always a problem no matter what conception of morality you hold. That’s the case against moralists. As I say, I find it reassuring because it confirms that my irksome attitude towards them is correct. And, to be fair, I think that some of the fears raised by the critics — undermining legitimate moral discourse and fostering resentment and polarisation — are valid and worth taking seriously. But I also worry about any argument that confirms my prejudices and preconceptions. It prompts me to probe deeper and consider alternative explanations for my attitude. Perhaps the problem is not that the moralists are miscalibrated but that I, myself, am miscalibrated? Maybe the case against moralists is unfair? Let me start with a minor criticism of the argument. I worry that there is something faintly paradoxical in criticising moralists in the above terms. Essentially, what the preceding argument does is to highlight a moral failing (Archer calls it a ‘vice’) among moralists. To criticise them for that moral failing is at least somewhat ironic: you are morally criticising those who engage in moral criticism. Admittedly, there is an easy way out of this ‘faint’ paradox. You can just say that your moral criticism of the moralist is legitimate. But that’s arguably too easy and is itself a problem if moralised discourse can, in and of itself, be poisonous. This is something that Tosi and Warmke point out in their article and is one reason why they discourage people from using their argument to criticise others. Instead, they encourage people to use the argument to reflect on their own behaviour. This minor criticism points the way to a deeper criticism — one that I think is the source of my ambivalence about the argument as a whole. The argument presumes that we are able to easily identify moralists, i.e. that we can tell who it is that is engaging in excessive moral criticism. But can we really? I certainly worry about my own ability to do this. Unless I assume my own moral infallibility, it’s quite possible that I am the one getting things wrong. Instead of the moralist being overreactive, maybe it is I who is being underreactive? This worry becomes more compelling when we reflect on how moral reform usually takes place. Consider, once more, Archer’s four examples of moralistic excess (the conflation of the superogatory with the obligatory etc). And consider all the great moral reform movements of the past (the anti-slavery movement, the women’s rights movement etc). Isn’t it the case that most of those reform movements were initially perceived to be engaging in excessive moral criticism? And didn’t they ultimately work because they shocked the majority out of their moral complacency? These movements pointed out that what the majority thought to be morally indifferent or neutral was, in fact, morally obligatory; that what they thought to be a legitimate excuse, was in fact anything but; and that what was thought to be a minor infraction or inconvenience was, in fact, a serious moral error. So I worry that this is why I find moralists irksome. It’s not that I think they are wrong or excessive. It’s that I think they might be right and that I am simply resisting uncomfortable change. I find this to be particularly true when I encounter the so-called ‘moral saints’ of this world, i.e. people who dedicate their lives to doing the most good they can possibly do. Larissa MacFarquhar’s book Stranger’s Drowning is filled with compelling portraits of such people, all selflessly dedicating themselves to improving the lives of others. In a famous philosophical essay, Susan Wolf once argued that such moral saints must live impoverished lives because by dedicating themselves to doing good they have no time for the usual humanistic pleasures. But I think moral saints also show us what is possible for beings like us. They show us that what we perceive to be excessively demanding (maybe even impossible) is in fact achievable.